If you're anything like us, it's been your lifelong dream to be an astronaut. If you're nothing like us, your lifelong dream may be to see your face on a tiny Tetris block. If you're in that second group, have we got some good news for you! 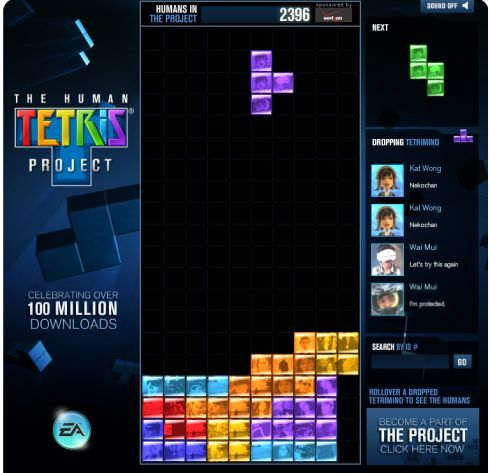 Late last Friday, Electronic Arts unveiled The Human Tetris Project as part of the classic game's 25th anniversary celebration. As the name implies, the "project" lets you turn any of your Facebook profile pictures into a single Tetris block, to be grouped with three random strangers into a full-fledged Tetrimino. You can personalize your block with a short message and then share the news with your friends as you wait for the team at EA to approve your submission. And then you get to play a wacky new version of Tetris with your and your friends making up the pieces, right? Well, no... actually you just get to watch a computer-controlled version of Tetris with blocks containing some of the random strangers that have similarly signed up for the project (nearly 2,400 as of this writing). Some would argue that this totally misses the point of everything that makes social gaming special and interesting, but... well, those people would be right, actually, and should probably apply for a job at Electronic Arts as soon as possible.